Where do you cross the line when it is love at first Sprite? “Now we can get married!”, exclaimed Heinz, looking at the skid marks on the pavement. He inhaled the distinct smell of burnt rubber as if it was the most alluring perfume. He reached out to massage his aching neck. He should have known better – no jerky moves. It was only just getting light, at 3 a.m. in the morning. Margit could feel the burning rubber but all she could see was the night sky. It was dawning. Utterly terrified, she huddled – squeezed really tight – behind Heinz’s seat. The seat was now empty as Heinz was stretching his legs talking to the armed men right outside Cafe Adler. Margit was trying hard but she couldn’t hear her mother. Heinz had decided to cram the woman into the dark tiny boot of the luxurious convertible. Despite the cramped space, he packed 30 coarse bricks all around the poor woman who didn’t say a word in protest, ready to sacrifice everything for her daughter, little Margit. Short of breath, Margit remembered her first dance with Heinz. It was then that she fell for him. And yes, it was the instant mutual attraction. A passionate bolt from the sky. But never did she expect how persistent and undeterred he could be to accomplish his daring plans. Never did she suspect that he would be eager to cross the line against all odds. As they were exchanging their long-awaited wedding vows on a hot August afternoon, Margit looked at Heinz, in open admiration. The happy bride couldn’t contain her overwhelming love. She knew she was the love of Heinz’s life. Her mum spotted that precious moment and felt tears of joy pricking her eyelids. Berlin Wall was erected in 1961 to divide east and west Berlin and, more precisely, to prevent people from East Berlin (the Soviet-held area) from escaping to West Berlin (governed by the Allied Forces). It went down in 1989, marking the end of the Cold War. Checkpoint Charlie (aka Checkpoint C) is the most famous border-crossing point, designated for diplomats, foreigners, and members of the Allied Forces (1961-1990). 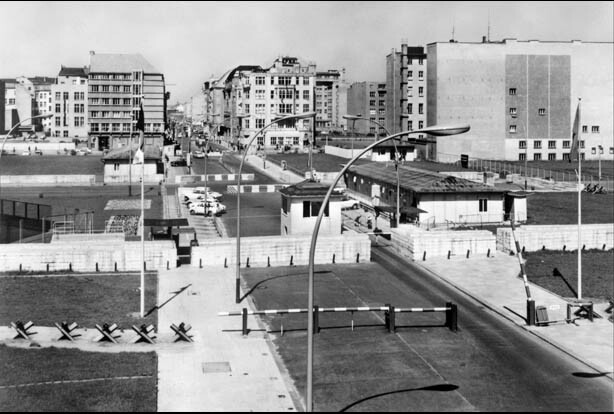 The West Berlin part of the checkpoint – with Adler Cafe right next to it – consisted of a minimalist guard house and a sandbag barrier, which looked oddly unimpressive compared to the Eastern part’s infrastructure. In May 1963, an Austrian named Heinz Meixner snuck his East German girlfriend Margit/Margarete Thurau and her mother across the border by lowering the windshield on and letting the air out of the tires of a rented Austin-Healey Sprite convertible and speeding underneath the checkpoint’s vehicle barrier. Another man later repeated the stunt before the East Germans added steel bars to the crossing. In both cases, the women had been denied the permission to emigrate to West Germany. Berlin War is constructed in 1961 to prevent East Berliners and Eastern Europeans from escaping into West Berlin. Checkpoint Charlie (aka Checkpoint C) is set up as one of the border-crossing points between the Allied-occupied West Berlin and the Soviet-held East Berlin. It is designated as the only crossing point for foreigners, diplomats and allied forces. Heinz Meixner, an Austrian guy, gets a job as a lathe operator in West Berlin. Heinz meets Margit Thurau, an East Berliner, at a dance in East Berlin. They fall in love. They decide to get married but Margit doesn’t get a permission from the East German authorities to move to Austria. Heinz decides to smuggle his girlfriend and his would-be mother-in-law into West Berlin. Meixner borrows a motor scooter and crosses the border at Checkpoint Charlie. While the guard checks his passport, Heinz measures the distance between the ground and the barrier: 37 ½ inches. He searches West Berlin’s car rental agencies until he finds the right car – a sports convertible, a red Austin-Healey Sprite. Without its windshield, the sports car measures 35 1/2 inches in height. Heinz sets the date for the run: Sunday, May 5, 1963 – after midnight. He prepares the car for the run: he removes the windshield & lets some air out of the tires. Now the car is the right height to go under the Checkpoint Charlie barrier. Heinz crosses the border and visits East Berlin on a tourist pass to meet his girlfriend and her mother. Margit huddles behind the driver’s seat. Her mother is crammed into the boot together with 30 bricks (to protect her against the possible gunfire from the border guards). The run starts after midnight. Meixner gets into the car, reaches the East Berlin side of the checkpoint, displays his passport to the guard. The guard sends him to the customs inspection area. Instead, Meixner accelerates, whizzes around the vertical bars, cones and other obstacles and skids past the armed guards. Before the guards could fire the guns, Meixner races to the last steel bar, ducks his head to go under the barrier, and enters West Berlin really fast. So fast, that when he finally hits the brakes, the tires have left 96-foot-long skid marks. Heinz and Margit get married on August 26. How do you tell the difference between STORY, PLOT, and NARRATIVE and how do you exploit it in the classroom? Find out here. Posted in featured, StoryTagged #BerlinWall, #loveatfirstsprite, #photoBookmark the permalink.